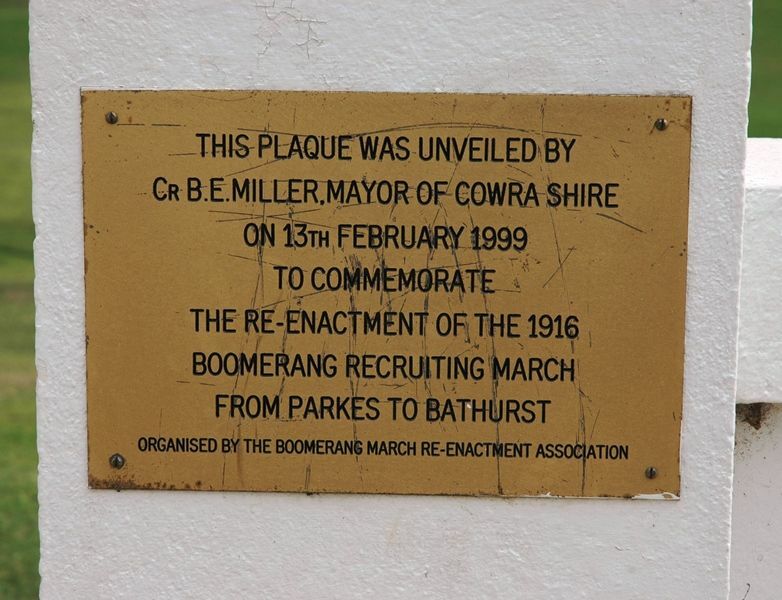 A plaque commemorates the re-enactment of the Boomerang Recruitment March from Parkes to Bathurst in 1916. From Parkes the Boomerangs took the train to Daroobalgie then marched to Donaghey’s Hill, Forbes, Yamma Station, Eugowra, Gooloogong, Canowindra, Billimari, Cowra, Woodstock, Lyndhurst, Carcoar, Blayney, Newbridge (to Georges Plains by train), Perthville, Bathurst. They arrived in Bathurst almost at the same time as the Kookaburras and were given a combined reception. They entered the new Bathurst Show Ground Military Camp for training.